Here is a copy of the Victim Impact Statement that I wrote. I had Julie Snowdon, the Crown Prosecutor, read it out in court today as I was unable to do so. My name is Christopher Thompson, and I married Ailish O’Connor on July 31, 2010. She died 263 days later. Ailish was an amazing woman, my best friend and my one true love. She was filled with energy and enthusiasm, and she surrounded herself with love. She tackled life with dedication, drive, and determination. Ailish made this place better and the people she met were enriched for having known her. Her death has destroyed my world. From early in our relationship, Ailish and I went on dates every Friday evening; now I just go to bed and hope for sleep. I cry all the time. I cannot focus on my work. I feel confused and utterly alone. My world is ashen and grey without her. I will never again be able to say that everything is right with the universe. 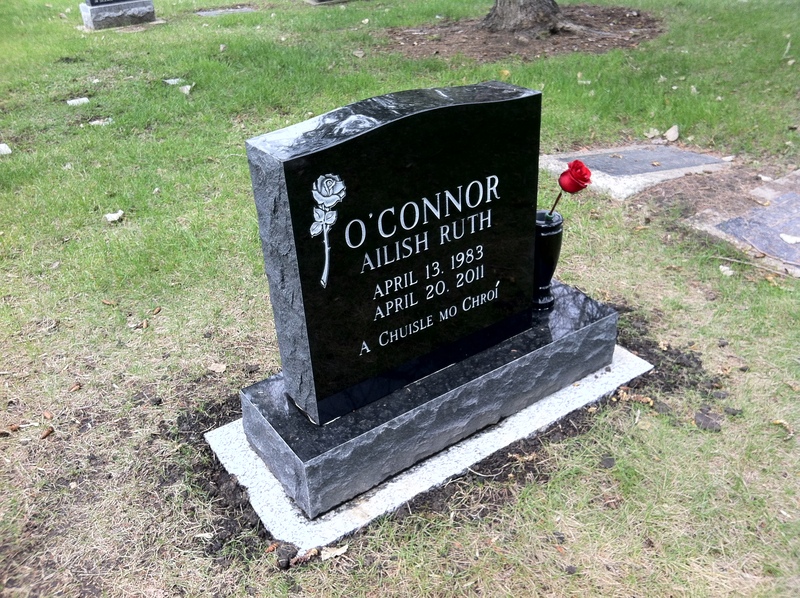 I loved Ailish O’Connor, and I miss her with every ounce of my being. Every day was better with Ailish in my life, and every day is worse since she left. Today, a friend of mine forwarded me a link to a blog post entitled, “How Do You Love Your Loved One?” I am at a loss for words; I think that article is just about perfect. Rather than adding any comments of my own, I encourage you all to go and read it. 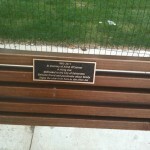 On Wednesday, June 29th, the City of Edmonton dedicated a bench to Ailish’s memory. 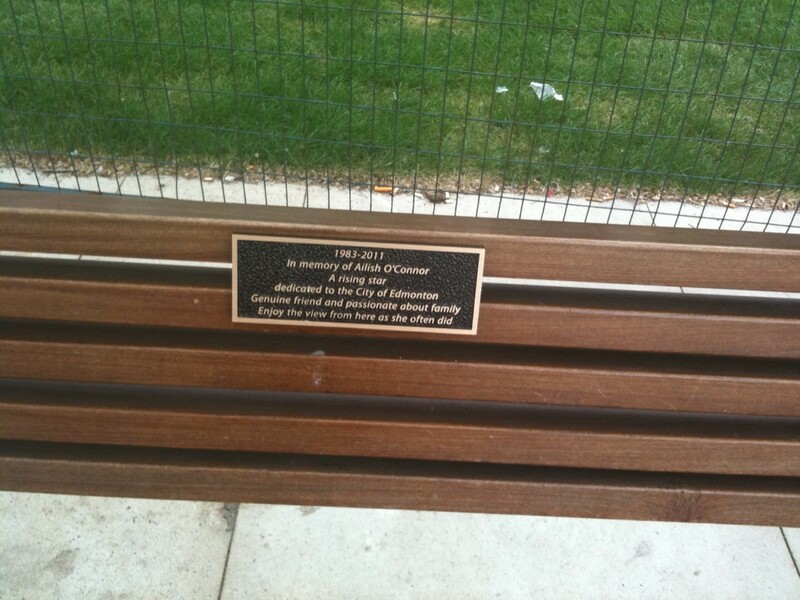 The bench is in Winston Churchill Square in downtown Edmonton, right across the street from Chancery Hall where Ailish worked. The service was lead by John Dowds, the City Chaplain. 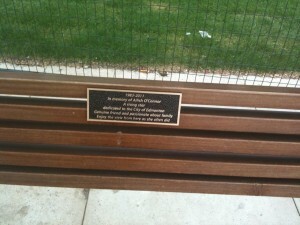 The bench dedication and the service was organised by Lorna Rosen, Ailish’s boss. I find it impossible to predict whether events like this will give me comfort, or just generally be hard and emotionally draining. Luckily, this was one of the former. It was wonderful to see so many of Ailish’s coworkers at the service, even though I got to talk to less than a tenth of them. Ailish loved working for the City of Edmonton. She felt that she could make a meaningful contribution to Edmonton itself, and she was challenged and inspired by her co-workers. Ailish and I often discussed the various projects she was working on, and the people she was working with. I wish I could have thanked everyone individually. Afterwards, the family (Ailish’s parents and brother, and my father) went out for lunch and some conversation. It was a good day, and a touching way to celebrate a hugely important part of Ailish’s life. Sometime after Ailish and I had professed our love for each other, Ailish had a conversation with me. She thought maybe we were saying, “I love you” too often. Maybe if we said it too often, it wouldn’t be as meaningful. I disagreed. I disagreed about as thoroughly as I ever disagreed with her about anything. I knew how amazing Ailish was even before our first date, and every single time I told her I loved her, I meant it. I meant it with every part of my soul. I thought we should say it more often. We should say it every morning, before we left for work. Every evening when we came home. When we were cooking supper. When we were sitting watching television. Before we went to sleep. And we did. And all I wish is that I could have told Ailish how much I loved her another million times. 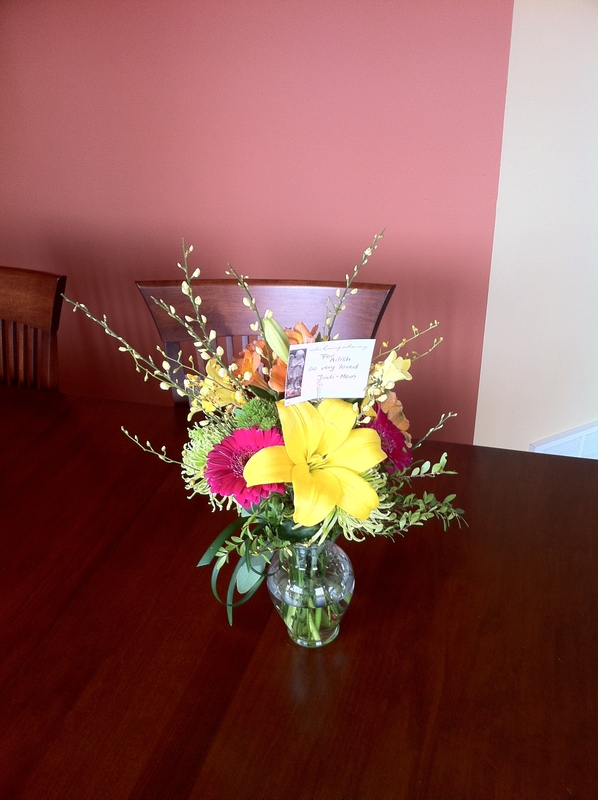 Here’s a link to flowers my mom sent. WordPress won’t attach images properly and I’m not going to fight it any more.